A good friend of mine named Billa Camp told me that a Skate Park was opening up this weekend in the South Loop. Billa’s vocals and production are featured in the new video game Watch Dogs and on ABC’s primetime television show Black Box (Episode 2 -Sweet Little Lies). He’s also been in Lupe Fiasco’s “Kick Push” video. 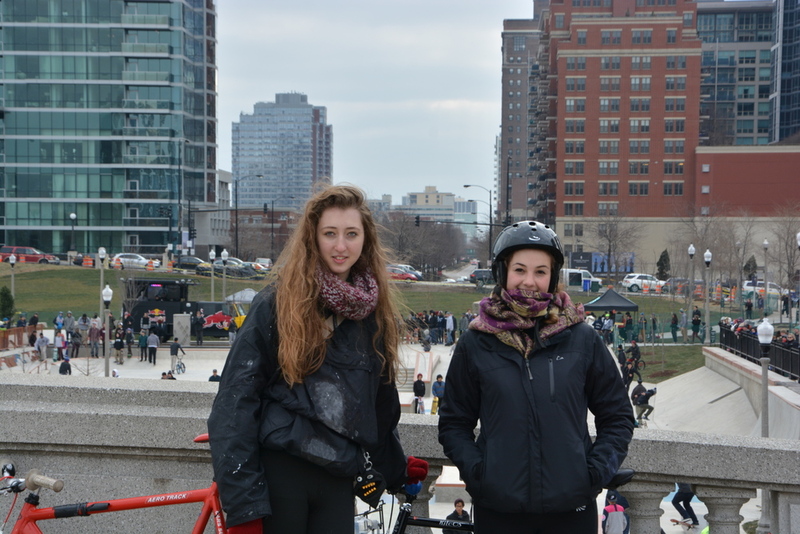 Through skateboarding, Billa Camp has performed almost everywhere in Chicago. 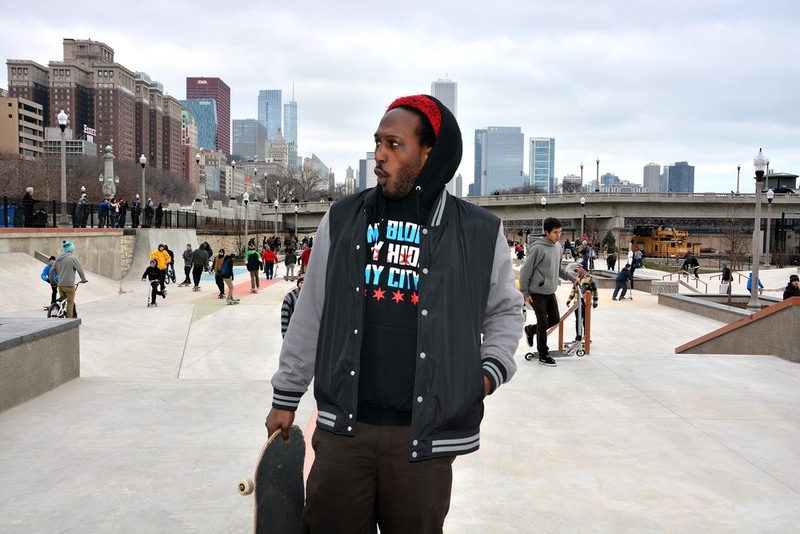 Turns out, the new addition to Grant Park is a crowdsourced skate park located at the former site of the Central Station in the South Loop community area.. Bob O'Neil, President of the Grant Park Advisory Council and Conservancy led the charge to bring this outlet to his community. He received support from a community of city bikers and skaters, which informed the design of the park. Uriya, the owner of Uprise Skate Shop played a big part in this event as well. I'll be back soon South Loop! I haven't forgot about all of the restaurants I frequently eat at like Flavor 180. Today was about Skateboarding though. It's awesome that Chicago put a skate park downtown! Week 10 of the 12 Parks in 12 Weeks Tour took me to Garfield Park located at 100 N. Central Park Ave on the West Side of Chicago. This park is a family reunion hot spot, at least for my family. While growing up, we had most of our yearly gatherings here. In all my years visiting this park, I've never seen a street hockey rink, as I approached, that's what it looked like. As I got closer to the fences, though, I recognized that this wasn’t a street hockey match. It sort of looked like Polo, except bicycles were used instead of horses. The players wore helmets and hockey gloves, but instead of hockey sticks, they were swinging mallets. Two goals were positioned at both ends of the court. The object of this game is to whack a small red ball into the goal. The name of this game is “Bike Polo.” If you haven't seen it, you should. I've got to admit, this game is pretty intriguing. It certainly almost enticed me to rent a Divvy Bike and call out NEXT GAME! But out of respect for the city's bike sharing program, and because there wasn’t a Divvy station near Garfield Park (Divvy Suggestions, Chicago's poorest hoods are being left behind), I decided, and was constrained, to the role of a spectator. This move proved to be the right choice, I didn’t bang up any Divvy property, but the players and their bikes got pretty banged up. I witnessed at least three spills that caused bloody arms and fingers. Dave, the President of Chicago Bike Polo said, "If it's one thing I've learned since playing Bike Polo, it's how to fall without getting hurt badly." 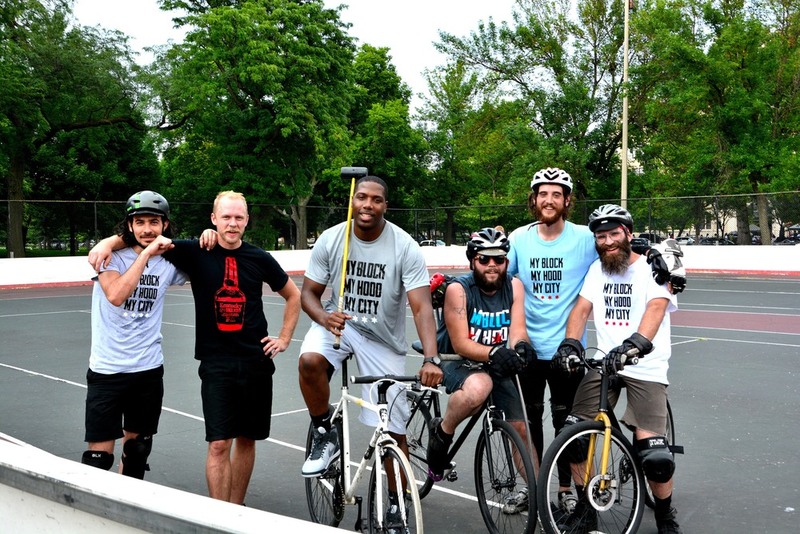 When the rink or court isn’t being used by the Chicago Bike Polo Team, Coach Perry is teaching middle-school aged teens from the Austin area how to play street hockey, a sport that was introduced to him by a few black guys from his block in the early 70’s. Despite the common dogma that black men don’t play hockey, Coach Perry sees it as an engagement tool for inner city youth. I asked him if the barrier of entry (cost for ice skates, gloves, helmet, shoulder pads, ice time) was the reason that inner city kids don’t play hockey, because they simply can’t afford to. He told me that this was a great question, and that the price of ice rink time in Chicago is so high that’s it’s led to many teams sharing ice rink time and splitting the costs, which could be as high as $20 a practice per kid. The work around or alternative to this is to play street hockey, where the barrier of entry is relatively small in comparison to traditional ice hockey. He also mentioned that he's received donations from the Illinois Legislative Black Caucus. Wonderful times lay ahead on the 12 Parks in 12 Weeks Tour. Oh,this week I wore the Grey Nike Dunks.